The proinflammatory cytokine IL-17A is considered a crucial player in rheumatoid arthritis (RA) pathogenesis. In experimental models of autoimmune arthritis, it has been suggested that the cellular source of IL-17A is CD4+ T cells (Th17 cells). However, little is known about the source of IL-17 in human inflamed RA tissue. We explored the cellular sources of IL-17A in human RA synovium. Surprisingly, only a small proportion of IL-17–expressing cells were T cells, and these were CCR6 negative. Unexpectedly, the majority of IL-17A expression colocalized within mast cells. Furthermore, we demonstrated in vitro that mast cells produced RORC-dependent IL-17A upon stimulation with TNF-α, IgG complexes, C5a, and LPS. These data are consistent with a crucial role for IL-17A in RA pathogenesis but suggest that in addition to T cells innate immune pathways particularly mediated via mast cells may be an important component of the effector IL-17A response. Understanding of the pathogenesis of rheumatoid arthritis (RA) has advanced substantially in recent years, driven in part by direct investigation of synovial tissue. Recently, the cytokine IL-17A has been linked to disease mechanisms. In rodent models, deficiency or blockade of IL-17A leads to suppression of arthritis (1). In humans, expression of IL-17A in RA synovium and synovial fluid was first described in 1999 (2). Initial phenotyping studies indicated that synovial T cells with plasmacytoid phenotypic characteristics expressed IL-17A. Most subsequent reports have focused on expression in peripheral blood, and few reports have studied Th17 cell markers in situ (3, 4). Th17 cells are a novel lineage of T helper/effector CD4 cells, selectively expressing the transcription factor RORγt (RORC gene product), that produce IL-17A, IL-17F, IL-22, CCL20, and other moieties, and are thought to account for initiation and maintenance of several inflammatory disorders (reviewed in Refs. 5, 6). Although there remains some controversy over the precise signals required for the development of murine and human Th17 cells, it is generally agreed that human CD4+ Th17 cells require IL-1, IL-6, and IL-23 for their proliferation and maintenance, cytokines that are detected in RA synovium. In human PBMCs, CCR6 and CCR4 are coexpressed on Th17 cells (7). CCR6 is thought to be involved in the recruitment of Th17 cells to sites of inflammation via the ligand CCL20. Even though in vitro phenotypic characteristics and commitment of Th17 cells appear robust, in vivo data increasingly support plasticity of this lineage. Transfer of Th17 cells into an experimental autoimmune encephalomyelitis model resulted in a shift from Th17 to Th1 phenotype (8). Moreover, T regulatory cells may express IL-17A under certain conditions but still retain suppressive function reflecting a more plastic cell commitment (9). Other cell types including γδ T cells, NKT cells, NK cells, neutrophils, and eosinophils have been reported to produce IL-17A (5, 6), as have innate CD4+ lymphoid tissue inducer-like cells (10). Also recently, mast cells have been described to express IL-17A and IL-17F (11, 12). Thus, in tissue, the net IL-17A expression may arise from a broad array of adaptive and innate cells. For this reason and because IL-17A is now being targeted in clinical trials, we sought to re-evaluate the dominant cellular source of IL-17A in established RA synovium. We show that Th17 cells are relatively rare in RA synovium. However, whereas a small percentage of macrophages produce IL-17A, mast cells are proportionally the cells that express the highest level of IL-17A in the RA synovium. Moreover, in vitro studies reveal that mast cells produce IL-17A in response to various inflammatory stimuli, including TNF-α, IgG complexes, C5a, and LPS, all of which are upregulated or contribute to the pathology of the inflammatory synovium, or both. Thus, our results show mast cells as a key source of IL-17A in RA, adding important evidence that mast cells in synovial tissue represent a promising target for RA treatment. Synovial tissue from patients with RA (n = 10) and osteoarthritis (OA) (n = 4) were obtained from the Centre for Rheumatic Diseases (Glasgow, U.K.) derived by arthroplasty. American College of Rheumatology classification for RA was fulfilled. Written informed consent was given before inclusion in the study, under approval from the Glasgow East Ethics Committee. Human umbilical cord blood samples were collected from normal full-term deliveries of informed individuals with formal consents, meeting the University Institutional Review Board guidelines (National University of Singapore, Singapore) for research using human samples. Five-micrometer sections of RA synovium were deparaffinized and rehydrated. The 0.5% hydrogen peroxidase/methanol incubation and heat retrieval in 0.5 M citrate buffer (pH 6) was followed by incubation in 2.5% species/2.5% human serum with Avidin D (Vector Laboratories, Petersborough, U.K.). Staining for 1 h with Abs (mouse anti-CD3 [1.25 μg/ml; Vector Laboratories], mouse anti-CD4 [7.56 μg/ml; Dako UK, Cambridgeshire, U.K.], rabbit anti-CCR6 [0.75 μg/ml; Sigma-Aldrich, Dorset, U.K.], mouse anti-mast cell tryptase [MCT] [0.43 μg/ml; Dako UK], or mouse anti-CD68 [1 μg/ml; Dako UK]) was followed by 30 min incubation with biotinylated Abs (1:200; Vector Laboratories) with subsequent staining with streptavidin QDot605 (1:250; Invitrogen, Paisley, U.K.) for 45 min. Goat anti–IL-17 (5 μg/ml; R&D Systems, Abingdon, U.K.) was added overnight at 4°C, then incubated with a biotinylated Ab for 30 min, and stained with Avidin FITC (1:500; Vector Laboratories) for 45 min. Slides were mounted with Vectashield containing DAPI (Vector Laboratories) and analyzed on a fluorescent imaging microscope (BX50; Olympus, Essex, U.K.). Images were captured using Apple Open laboratory software. For immunhistochemistry, prepared RA or OA sections were incubated with goat anti–IL-17 overnight, incubated with ImmPRESS reagent anti-goat Ig for 30 min (Vector Laboratories), and signal-developed using the peroxidase substrate nickel diaminobenzidine tetrahydrochloride (Vector Laboratories). Images were captured digitally, and the total number of IL-17A+ cells was calculated that were found within duplicate tissue areas (two representative ×10 fields) of 0.52 mm2. Double staining allowed us to calculate the proportion of IL-17A–expressing cells per cell surface marker. Four tissues were double-stained for all markers, with confirmatory studies performed on a further six tissues to confirm the coexpression with MCT and CD68. Human mast cells were derived from CD34+ hematopoietic progenitor cells isolated from umbilical cord blood and cultured as described previously (13, 14). Mast cells were stimulated with TNF-α (10 ng/ml), IgG complexes (100 ng/ml), C5a (5 ng/ml), or LPS (10 ng/ml) for 24 h, and supernatant was tested for IL-1β, IL-5, IL-6, and IL-17A by ELISA (ELISA kits from eBioscience, Hatfield, U.K.). IgG complexes were formed by heating 1 μg IgG to 60°C for 15 min to generate aggregated IgG complexes. Average and SD are shown from three independent experiments. Total RNA was isolated using an RNeasy kit (Qiagen, West Sussex, U.K.), and cDNA was synthesized using a High-Capacity cDNA Archive kit (Applied Biosystems, Warrington, U.K.). The primers for RORC and STAT3 were purchased from Applied Biosystems, and gene expression was measured by quantitative real-time PCR using TaqMan Gene Expression Assays (Applied Biosystems). Results are expressed for each gene as the relative gene expression normalized to the 18S mRNA expression. STAT3 gene expression was monitored as a control (Supplemental Fig. 2). Ready-made RORC small interfering RNA (siRNA) and negative control siRNA were purchased from Qiagen. The siRNAs were transfected, using the HiPerFect Transfection Reagent from Qiagen, and 48 h later experiments were carried out. Expression levels were monitored by real-time PCR (Supplemental Fig. 2). We first established the tissue location of IL-17A–expressing cells using light microscopy. Cytoplasmic IL-17A staining was observed in cells of an ovoid/plasmacytoid phenotype, as described previously (2), and in cells of a more irregular phenotype, both at the periphery of lymphocytic aggregates, in the sublining layer areas, and rarely in the lining layer (Fig. 1). Interestingly, IL-17A–positive cells were also occasionally detected in OA tissue, but with low frequency (Supplemental Fig. 1). To formally identify these IL-17A+ cells in RA synovium, we performed colocalization studies and calculated the proportion of IL-17A+ cells contained in each cellular subset. We first investigated a variety of T cell markers, namely, CD3, CD4, and CCR6, colocalized with IL-17A. Although occasional CD4+IL-17A+ cells were identified, the majority of IL-17A+ cells were CD4-negative (<1%), consistent with the notion that CD4+ Th17 cells represent a minority of the IL-17A–producing population in synovitis (Fig. 2, upper left panel, Table I). This also renders it unlikely that lymphoid tissue inducer-like cells are major contributors, because these cells express CD4 (10). Moreover, counterstaining with CCR6, a previously defined marker for Th17, cells did not colocalize with IL-17A (Fig. 2, upper middle panel). CD3+CD8+ T cells have been shown to produce IL-17 (15). Of interest, only 1–8% of IL-17A–expressing cells were found to express CD3 (Fig. 2, lower middle panel, Table I)—by inference from the foregoing, these most likely comprise CD8+ cells or γδ T cells. IL-17A expression in RA synovium. Cells staining for IL-17A by immunohistochemistry show different cell morphology. Squares and arrows demonstrate different examples. Two fields (×40) of a representative RA synovium tissue are shown. Th17 cells are hardly detectable in established RA synovium. Synovial tissue samples from RA patients (n = 10) were stained for IL-17A (green) and indicated markers. Sections were counterstained with DAPI. Th17 cell markers CCR6 and CD4 or CD3 (red) and macrophage marker CD68 (red) are shown at ×40 magnification. MCT (red) and IL-17A double staining are shown at ×10 (upper right panel) and ×40 (lower right panel) magnifications. We next addressed the phenotypically distinct subset of IL-17A+ cells of irregular shape. The latter initially suggested macrophages as a potential lineage—IL-17A production by macrophages has been suggested in allergic lung inflammation (16). Consistent with this, up to 35% of IL-17A+ cells were CD68+. However, because a substantial number of IL-17A cells remained unattributed in these studies, we sought additional cellular sources (Fig. 2, lower left panel, Table I). Tissue-like mast cells have been reported to produce IL-17A upon TLR2 stimulation (17). To determine whether mast cells might be an additional source for IL-17A, we colocalized MCT and IL-17A (Fig. 2, upper and lower right panels, Fig. 3). The majority of IL-17A+ cells double-stained strongly with MCT (46–100% of IL-17A–expressing cells per tissue area across patients), clearly demonstrating that mast cells are key producers of IL-17A in RA synovium (Table I). Mast cells express IL-17A in RA synovium. MCT (red) and IL-17A (green) are shown single-stained and merged with DAPI counterstain (left panel, ×40 magnification). This is further digitally magnified to demonstrate cellular structure (right panel). The factors that might drive synovial mast cell IL-17A expression have not previously been explored. RA synovial membrane contains a number of candidate pathways that could promote IL-17A expression, including complement factors, immune complexes, cytokines, and TLR ligands. To investigate these further, we derived mast cells from CD34+ progenitor cells (13, 14). TNF-α (10 ng/ml), heat-aggregated IgG complexes (100 ng/ml), C5a (5 ng/ml), or LPS (10 ng/ml) were added to these mast cells for 24 h, and cytokine production was measured. Interestingly, stimulation with each of these factors resulted in production of IL-17A in similar levels compared with those of IL-1β, IL-5, and IL-6 (Fig. 4A), with C5a and LPS as the higher inducers of IL-17A followed by IgG complexes and TNF-α. Other Th17-associated cytokines (IL-21 or IL-22) were not detectable. A combination of all of the above mentioned stimuli had a synergistic effect in the production of IL-17A by mast cells (data not shown). We next observed that mast cells express RORC and that this gene is upregulated by the different stimuli used to trigger the production of IL-17A (Fig. 4C). To test the functional significance of this pathway, we were able to specifically silence RORC gene expression with siRNA-RORC without affecting other genes such as STAT3 (Fig. 4C, and Supplemental Fig. 2). Finally, we analyzed mast cells transfected with RORC siRNA for their cytokine profile. 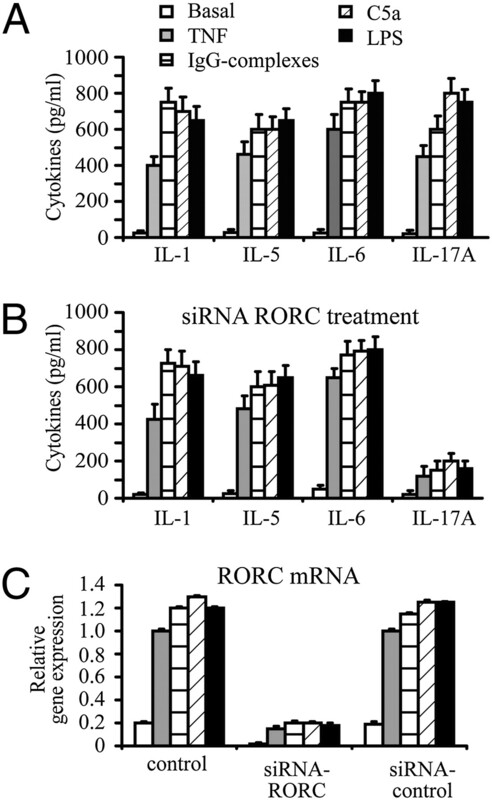 The different stimuli-triggered production of IL-17A was inhibited by siRNA-RORC–treated cells, whereas production of other cytokines, including IL-5 and IL-6, was unaffected (Fig. 4B). Interestingly and providing a further control for specificity, silencing of STAT3, RORalpha, or Foxp3 had no influence on IL-17A production (data not shown). RORC-dependent IL-17A production by CD34+-derived mast cells. Cytokine release was determined from mast cells, untransfected (A) or siRNA-RORC–transfected (B), after 24 h stimulation with TNF-α, IgG complexes, C5a, and LPS, compared with a basal secretion (unstimulated cells). Cell culture supernatants were analyzed for bioactive IL-1β, IL-5, IL-6, and IL-17A by ELISA. RORC gene expression was determined by quantitative real-time PCR and silenced by siRNA targeting RORC (C). Results shown are the mean plus the SD of triplicate measurements of three separate experiments. These data have important implications for understanding how mast cells and IL-17A can contribute to RA pathogenesis and crucially suggest that IL-17A is an important mediator of innate as well as adaptive effector functions. Supportive to our data, two groups reported only the rare occurrence of IL-17+CD4+ cells compared with a predominance of Th1 cells in the joints of RA patients (18, 19). In allergic lung inflammation related to asthma, alveolar macrophages have been identified as a major source of IL-17. Furthermore, in vitro analysis showed that alveolar macrophages upregulated IL-17 expression via mast-cell–derived mediators (16). 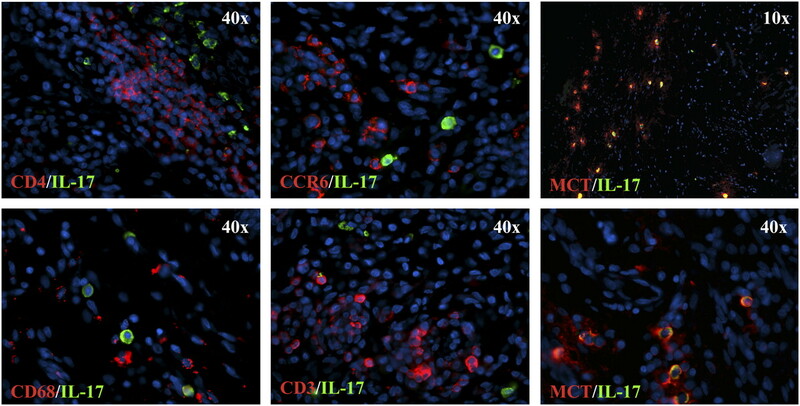 Moreover, IL-17 expression has been detected in breast tumor tissue within the scattered tumor-associated inflammatory infiltrate identified as macrophages (20). In our study, up to 35% of IL-17A–producing cells were CD68+, suggesting that in RA this lineage can also contribute to IL-17A production. 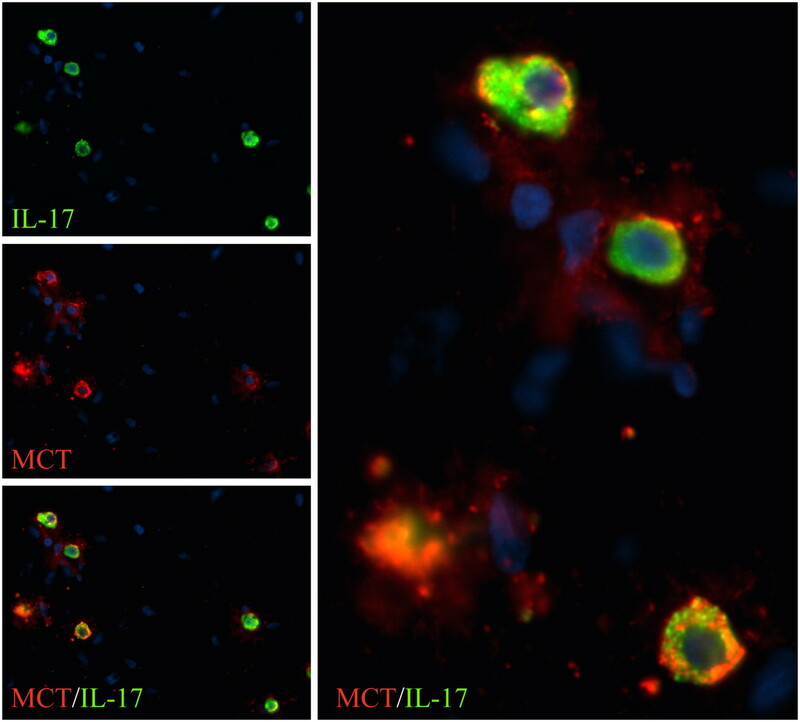 The crucial observation in our study was the colocalization of IL-17A with MCT, a highly specific marker for mast cells in tissue. Mast cells have recently re-emerged as crucial effectors in the pathogenesis of arthritis. Their presence has long been recognized in synovial tissue and at the cartilage–pannus junction (21). Lee et al. (22) reported that mast-cell–deficient mice were resistant to the development of Ab-induced arthritis. IL-1 was clearly implicated in this pathway, but to our knowledge, IL-17 was not investigated in this context. However, production of IL-17 by mast cells has been observed elsewhere. Murine peritoneal-derived, cultured mast cells secrete IL-17 in response to TLR2 and TLR2/6 agonists (17). This is consistent with our observations of IL-17A expression in CD34+ mast cells and tissue mast cells in RA synovium. Several provisos are required in interpreting our data set. Our data refer only to established synovitis. Raza et al. (23) reported that in early compared with established RA synovial fluid IL-17A levels were significantly higher. The role that Th17 cells play, as opposed to innate pathways, as a source for IL-17A in early arthritis therefore needs to be determined. With the emerging plasticity of Th17 cells, it is possible that their cytokine profile, and indeed chemokine receptor expression (particularly CCR6), might change upon entry to the tissue compartment or over the course of the disease. IL-17 blockade, in clinical trials, is suggested to have beneficial effects in psoriasis and in RA as a potential novel therapeutic, although formal appropriately designed and powered trials are required (24, 25). Interestingly, responses in such studies are fairly rapid, suggesting that the clinical effect may be mediated via blockade of the cytokine in circulation. Interestingly, our study strongly suggests that targeting mast cell responses may also lead to beneficial effects in RA, because activated mast cell contribute to the IL-17–rich environment and therefore may promote an amplification of innate responses in the joint (e.g., by activating neutrophils and by synergizing with TNF and IL-1 to drive increased cytokine/chemokine and eicosanoid synthesis). In conclusion, our study demonstrates that proportionally mast cells and not Th17 cells appear to be a major source of IL-17 in established RA synovium and that such production can be driven by a variety of pathways abundantly expressed therein. We thank A. Morton and M. McGraith for technical assistance, the orthopedic unit, Glasgow Royal Infirmary, and D. Meek on behalf of the orthopedic unit, Glasgow Southern General, for obtaining RA samples. This work was supported by the Medical Research Council U.K. A.J.H. is supported by a Deutsche Forschungsgemeinschaft fellowship. A.M.M. is supported by a British Heart Foundation Intermediate Basic Science Research Fellowship (FS/08/035/25309).
. 2007. Interferon-gamma regulates susceptibility to collagen-induced arthritis through suppression of interleukin-17. Arthritis Rheum. 56: 1145–1151.
. 1999. Human interleukin-17: a T cell-derived proinflammatory cytokine produced by the rheumatoid synovium. Arthritis Rheum. 42: 963–970.
. 2009. In vivo activated monocytes from the site of inflammation in humans specifically promote Th17 responses. Proc. Natl. Acad. Sci. USA 106: 6232–6237.
. 2009. Monocyte derived interleukin (IL)-23 is an important determinant of synovial IL-17A expression in rheumatoid arthritis. J. Rheumatol. 36: 2403–2408.
. 2009. IL-17 and Th17 Cells. Annu. Rev. Immunol. 27: 485–517.
. 2009. Interleukin-17 and type 17 helper T cells. N. Engl. J. Med. 361: 888–898.
. 2007. Surface phenotype and antigenic specificity of human interleukin 17-producing T helper memory cells. Nat. Immunol. 8: 639–646.
. 2008. Cutting edge: Th1 cells facilitate the entry of Th17 cells to the central nervous system during experimental autoimmune encephalomyelitis. J. Immunol. 181: 3750–3754.
. 2009. IL-17-producing human peripheral regulatory T cells retain suppressive function. Blood 113: 4240–4249.
. 2009. 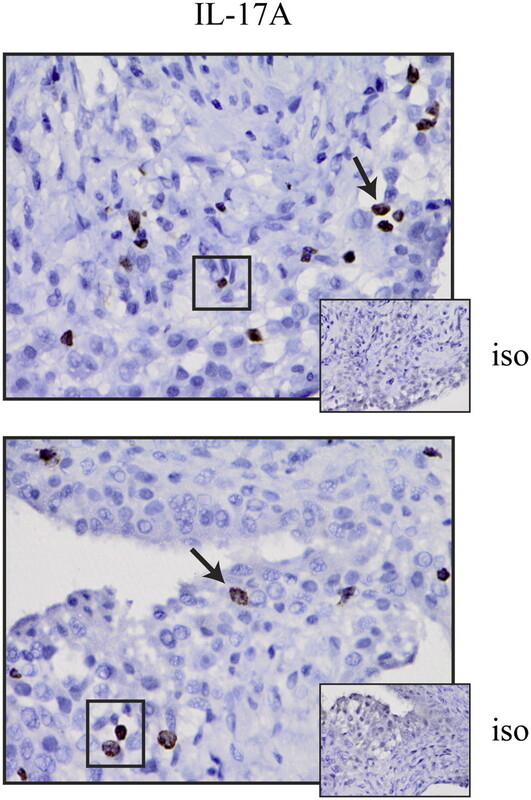 Lymphoid tissue inducer-like cells are an innate source of IL-17 and IL-22. J. Exp. Med. 206: 35–41.
. 2009. IL-17A expression is upregulated in the hypoxic joint and correlates with IL-6 production, inflammatory cell infiltrate and oxidative damage. Arthritis Rheum. 60(Suppl 10): 1343 (Abstr.).
. 2009. Differential expression of interleukin-17 family cytokines in intact and complicated human atherosclerotic plaques. J. Pathol. 220: 499–508.
. 2006. Genome-wide gene expression profiling of human mast cells stimulated by IgE or FcepsilonRI-aggregation reveals a complex network of genes involved in inflammatory responses. BMC Genomics 7: 210.
. 2007. Inhibition of Fc epsilon RI-mediated mast cell responses by ES-62, a product of parasitic filarial nematodes. Nat. Med. 13: 1375–1381.
. 2009. IL-23 drives pathogenic IL-17-producing CD8+ T cells. J. Immunol. 182: 5296–5305.
. 2008. IL-17-producing alveolar macrophages mediate allergic lung inflammation related to asthma. J. Immunol. 181: 6117–6124.
. 2009. Murine mast cells secrete a unique profile of cytokines and prostaglandins in response to distinct TLR2 ligands. Exp. Dermatol. 18: 437–444.
. 2008. Th1 but not Th17 cells predominate in the joints of patients with rheumatoid arthritis. Ann. Rheum. Dis. 67: 1299–1304.
. 2009. Gamma/delta T cells are the predominant source of interleukin-17 in affected joints in collagen-induced arthritis, but not in rheumatoid arthritis. Arthritis Rheum. 60: 2294–2303.
. 2008. IL-17 expression by breast-cancer-associated macrophages: IL-17 promotes invasiveness of breast cancer cell lines. Breast Cancer Res. 10: R95.
. 1995. Distribution, activation and tryptase/chymase phenotype of mast cells in the rheumatoid lesion. Ann. Rheum. Dis. 54: 549–555.
. 2002. Mast cells: a cellular link between autoantibodies and inflammatory arthritis. Science 297: 1689–1692.
. 2005. Early rheumatoid arthritis is characterized by a distinct and transient synovial fluid cytokine profile of T cell and stromal cell origin. Arthritis Res. Ther. 7: R784–R795.
. 2009. AIN457, an anti-IL-17 antibody, shows good safety and induces clinical responses in patients with active rheumatoid arthritis (RA) despite methotrexate therapy in a randomized, double-blind proof-of-concept trial. Ann. Rheum. Dis. 68: 123 (Abstr.).
. 2009. Safety, tolerability and evidence of efficacy of intravenous LY2439821 in patients with rheumatoid arthritis receiving background oral DMARDS. Ann. Rheum. Dis. 68: 125 (Abstr. ).